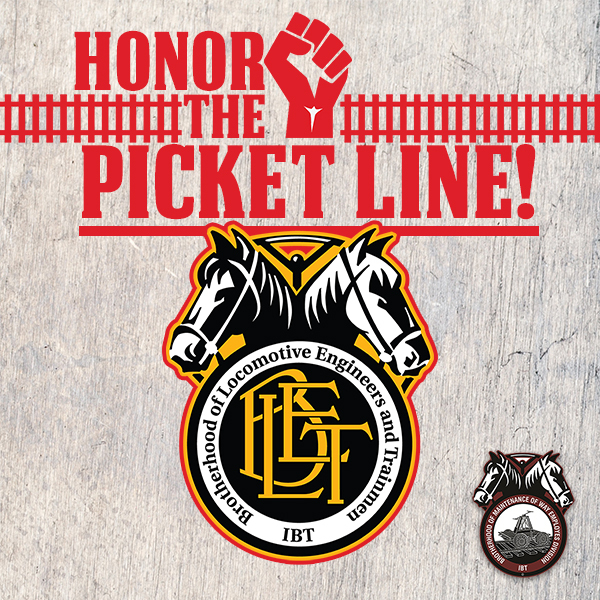 BMWED has learned that there is a dispute between the Brotherhood of Locomotive Engineers and Trainmen of the International Brotherhood of Teamsters (BLET-IBT) and Kansas City Southern Railway (KCS), involving KCS’ plans to replace BLET-represented American train crews with Mexican train crews in Laredo, Texas. If this dispute is not resolved, BLET is prepared to strike at 12:01 a.m. on Monday, July 9, 2018. If a strike occurs, it is likely that BLET will be picketing KCS facilities or operations. If you are a BMWED member working for KCS and you see a picket line, DO NOT CROSS THE LINE. Because the solidarity and mutual aid and support unions need to effectively represent their members requires honoring picket lines, which can mean loss of earnings for our members in good standing who support their brothers and sisters, BMWED provides strike benefits in the amount of $120 per day for the first 14 days of picketing/unemployment from the strike. Thereafter, and effective with entitlement for Railroad Unemployment Insurance Act Benefits (RUIA), members in good standing will be entitled to Strike Benefits equal to $120 per day when combined with RUIA benefits. Strike benefits will terminate upon the date the strike or lockout terminates, unless the Strike Fund is exhausted at an earlier date. Solidarity and mutual aid and support are essential to our ability to stand up for our members and for their rights and interests. Anyone who crosses a picket line is subject to a minimum fine of $200 per day worked during the strike, in accordance with BMWED National Division Bylaws Article XIX, Section 17. DO NOT CROSS THE LINE. If you have any questions regarding the Strike Benefits please contact your General Chairperson.